Simple and useful, the White Recycled Plastic Ruler is one of those items that needs to be in your professional or educational resources. Staying true to a classic design, it is easy-to-use and highly effective at performing its job. 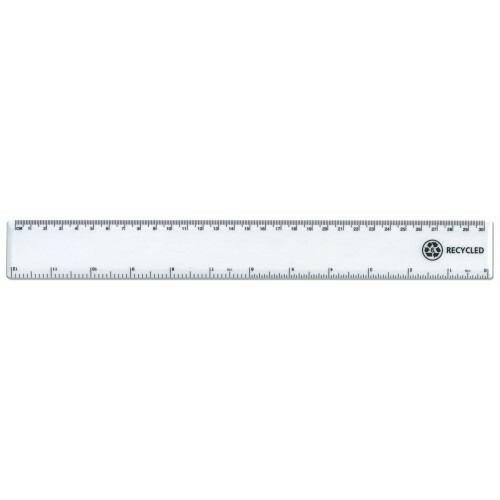 Straight lines or measuring alike, this ruler lends itself to every purpose with a strong and durable design to match. It has been crafted from a white recycled plastic - a material that wipes clean easily, offers a gentle flex to reduce snapping risk and is lightweight enough to be carried on your person. Rounded corners and smoothed edges reduce the risk of injury during use and make it perfectly suited to use by children of younger ages. Along the front, contrasting black measurement indicator lines and numbers make it clear and easy to use at any given time. Simply line up to marks against the side and determine the exact measurement of space between them. Or run a pencil or pen along the smoothed edges to create a perfectly straight line. Whatever the tasks at hand, this traditionally styled ruler provides 30cm of service that is sure to last throughout either your schooling or career progression. Bulk purchase is an important consideration when it comes to rulers. This is why we offer discounted prices per ruler for bulk order. For those over 10 rulers, each one will be priced at £0.24 and orders over 100, this drops to £0.18. This allows us to bring the highest quality products straight to your business and within your budget.